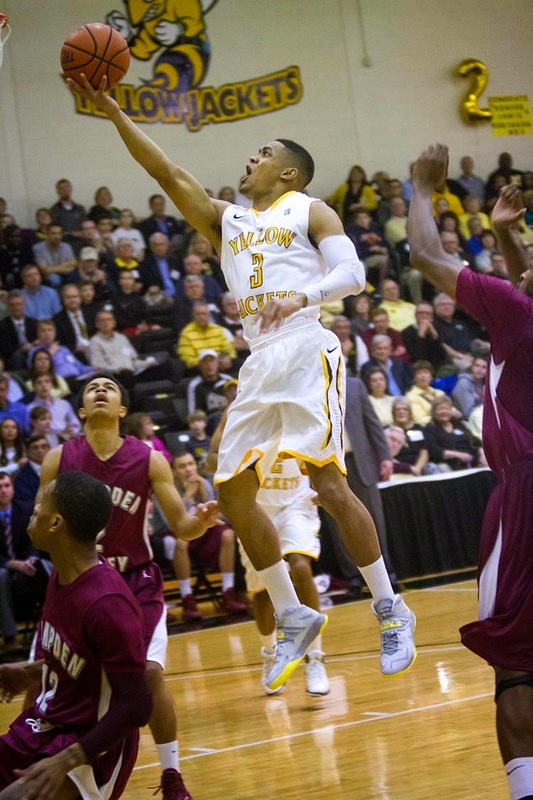 Last February, Randolph-Macon men's basketball thumped their archrival Hampden-Sydney by 23 points, the crescendo on a promising season that included an Old Dominion Athletic Conference (ODAC) regular season title, but a very disappointing ending. Tonight, the Yellow Jackets set a school record for consecutive victories with seventeen, and captured a share of the ODAC championship again, with a 79-65 victory over the Tigers, the ninth over Hampden-Sydney in their last 13 meetings. But this time, Randolph-Macon left the court with a totally different swagger, the look of a team that knows they have much, much work to do. So how did the Yellow Jackets win seventeen straight? "It starts with the leadership we have on the team; Marcus and the captains, and the entire senior class," said Yellow Jackets head coach Nathan Davis, who now has a career coaching record of 133-38. "We've got more to play. We've got to keep getting better." Marcus is point guard Marcus Badger (pictured below), who posted a career-high fourteen assists in the victory. "Fourteen? Really?," Badger said when told of his line score. "I did not know that, but, yes, that's my career-high." The senior surveyed the scene as the game began, taking in what the Tigers were doing defensively, and went to work. "They were helping all over, and we were driving a lot, and I was able to find men open," Badger recalled. "They switched to zone when they figured out the man wasn't working, but we kept on doing what we were doing." In the first half, that "doing" was nailing three-pointer after three-pointer, especially freshman Mike Silverthorn, who hit his first five three-point shots to help the Yellow Jackets build a 24-12 lead just over ten minutes in. Hanover High graduate Greg Lewis, who had 16 points for the Tigers, helped keep Hampden-Sydney within reach by halftime, down 39-29. Davis joked about why he offered Silverthorn last year. "He can shoot the ball," Davis said. "He can, but he also has good size and was athletic enough. And he can really shoot." The treys didn't rain down as much after intermission, as Randolph-Macon began to attack the paint in response to Tiger defensive adjustments. Joe Hassell, who had a double-double with 11 points and 10 rebounds, had seven of each in the second half. Whereas eight of Randolph-Macon's eleven first-half field goals were from beyond the arc, half of their second half performance from the field came inside. The Tigers cut the lead down to seven on two occasions in the second half, the last at 49-42 with 12:56 to play. What followed was a 10-0 Yellow Jackets run ignited by a three-pointer from Lamont Moore, who scored all seven of his points after the break. It ended on a Silverthorn two-pointer from the baseline for a 59-42 lead. Hampden-Sydney never got closer than twelve points again. With the victory, the Yellow Jackets clinched a share of the ODAC regular season title, as Virginia Wesleyan lost earlier in the evening to fall to 10-3 in conference play. Randolph-Macon is 13-0 and own two wins over the Marlins. The number one seed in the ODAC Tournament in two weeks is theirs, the title officially outright theirs with one more victory, no sharing of top records. Badger, one of eight seniors who will be honored on Senior Night next Wednesday against Shenandoah, talked candidly after the game about last season's bitter ending, and how they are ready to prevent it from happening again. "We can't relax. It all starts on the defensive end," Badger explained. "We kind of let down a little bit today, but we got it back defensively. We focus on that, and play one game at a time." Randolph-Macon (13-0, 20-2) goes for their 18th straight win Saturday at 2pm when they travel to Randolph College.